The movement's biggest triumph was opening the eyes of people to their rights to forests, and how grass roots activism can influence policy-making regarding shared natural resources. Google on Monday commemorated the 45th anniversary of the Chipko movement with a doodle. The doodle depicts four women bedecked in traditional attire, holding hands and forming a chain around a tree, with the fauna which are denizens of the forest portrayed as spectators to this scene of solidarity that is played out on a starry night. In 1973, villagers in Uttar Pradesh’s Chamoli district (now Uttarakhand) took to hugging trees to prevent their felling at the hands of contractors and to protect trees from the deforestation that accompanied rapid industrialisation in the years following independence. The word 'chipko', which means to hug, soon became the name of the eponymous movement, and the catchphrase for environmentalists the world over. However, the practice of embracing trees, both literally and figuratively, predate the Chipko movement. The Bishnoi community in Rajasthan were the pioneers in protecting forest resources. In the 18th century, a group of peoplefrom 84 villages in Rajasthan united under a woman called Amrita Devi, and laid down their lives to protest a royal decree that commanded the felling of trees. Taken aback by the self-sacrifice of his subjects, the Maharaja of Jodhpur went on to rescind his order preventing the felling of trees in all Bishnoi villages. 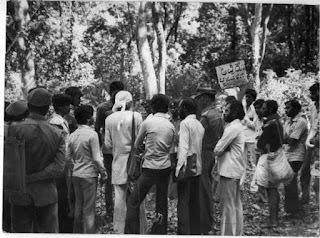 The first Chipko movement in independent India took place in April 1973 in the upper Alakananda valley, where the government of Uttar Pradesh had allotted a plot of land inside forest territory to a manufacturer of sports goods. With aid from a non-governmental oraganisation, DGSS (Dasoli Gram Swarajya Sangh), the women of the village united under Chandi Prasad Bhatt and adopted the strategy of hugging trees to protect them from the men contracted to clear the forest. By putting their bodies on the line, many trees were saved by the heroics of the women who formed human chains around them. They ensured that the forest would remain inviolable unless the men resorted to bloodletting. Since the leaders and proponents of the Chipko movement were mainly rural women, it came to be identified with eco-feminism. This instance of successful grassroots activism soon spilled over into other parts of the country, and became a means of in influencing natural resource policy. Other notable green warriors include Sunderlal Bahuguna, a Gandhian activist and philosopher, who was instrumental in garnering the support of Indira Gandhi, then Prime Minister of India, in enacting a law to ban the felling of trees in ecologically sensitive forest lands. He also coined the Chipko slogan: 'ecology is permanent economy'. 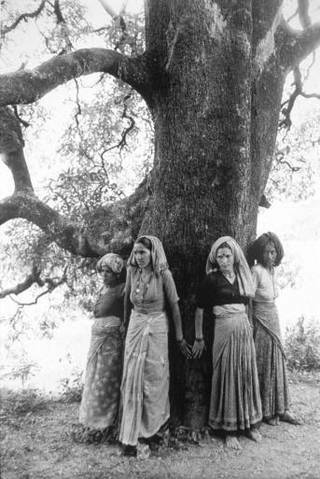 After half a decade of stoic protest, the Chipko movement bore fruit in 1980, with the government banning the felling of trees in the Himalayan forests of Uttar Pradesh for a period of 15 years. Subsequently, the green-felling ban was extended to forests in the Western Ghats and the Vindhyas. In addition to meeting the objective of ensuring the sanctity of endangered foretse for the years to come, the Chipko movement's biggest triumph was in opening the eyes of the people to their rights to forests, and how grassroots activism can influence policymaking regarding shared natural resources. According to the biennial State of Forests Report 2017, India registered a marginal increase in forest cover between 2015 and 2017. It was found that the land under forest cover amounted to 7,08,273 square kilometres, which is 21.53% of the geographical area of the country (32,87,569 sq. km).